Toyoda sees Europe car sales continuing to slow. TOKYO (Bloomberg) -- The European debt crisis, the appreciating yen and slowing automobile demand in the United States are among the concerns facing Japan's automobile industry, Toyota CEO Akio Toyoda, speaking as chairman of the Japan Automobile Manufacturers Association, told reporters in Tokyo today. Although optimistic on the outlook for the year, Toyoda said: "In the short run, the European economy and a possible slowdown in the recovery of the U.S. auto market is a concern." The yen is also a "major concern," he added. Japan's three-biggest carmakers have surrendered most of their January-to-March stock gains as concerns about the European debt crisis has pushed up the value of the Japanese currency since mid-March. The yen, the worst-performing major currency in the first quarter, is the best performer this quarter, according to data compiled by Bloomberg. 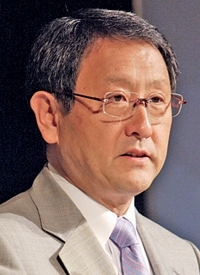 Toyoda said he's still optimistic for the year as consumers replace their vehicles. Toyota is forecasting group sales to climb 21 percent to a record 9.58 million vehicles in 2012 after natural disasters in Japan and Thailand interrupted production last year. In 2011, Toyota sold 7.95 million vehicles. "In Europe, where vehicle ownership is already very high, the cycle that drivers replace their old cars may slow down, but measures to avoid a major slowdown in the replacement cycle are taken in each country," Toyoda said. Toyoda said the downturn in the European financial markets has not yet been felt in actual sales results. "In reality, compared with the world of finance, there is a slight gap in the timing of when things occur," Toyoda said. "For there to be any impacts in the real world, it takes time, unlike information, which comes in a very timely manner." In the United States, light-vehicle sales in May ran at a 13.8 million seasonally adjusted annualized rate, according to data compiled by Autodata Corp. last week. The pace missed the 14.4 million average estimate of 14 analysts surveyed by Bloomberg and slid below 14 million for the first time this year. On China, Toyoda said demand may rebound in the longer term. "Though there is concern over the Chinese economy's outlook, there is still sustainable growth in China, and the buyers are spreading to the middle class," Toyoda said.